Mothers and their babies are often said to share a deep, intimate connection...but even so, this new discovery is weird. Simply by looking and smiling at each other, moms and babies synchronize their heartbeats to within milliseconds of each other. 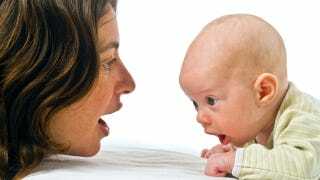 Mothers and their 3-month old infants were observed during face-to-face interactions while cardiac output was collected from mother and child. Micro-analysis of the partners' behavior marked episodes of gaze, affect, and vocal synchrony. Time-series analysis showed that mother and infant coordinate heart rhythms within lags of less than 1 s.
Bootstrapping analysis indicated that the concordance between maternal and infant biological rhythms increased significantly during episodes of affect and vocal synchrony compared to non-synchronous moments. Humans, like other mammals, can impact the physiological processes of the attachment partner through the coordination of visuo-affective social signals. However, humans can actually synchronize in ways other animals cannot — while other animals are dependent upon physical contact for this synchronization effect to occur, a mother need only look at her baby affectionately for the heartbeats to synchronize. It hasn't yet been tested whether infants can form similar levels of attachment with other people, such as their fathers. Via Infant Science and Development. Stock image by Noam Armonn, via Shutterstock.